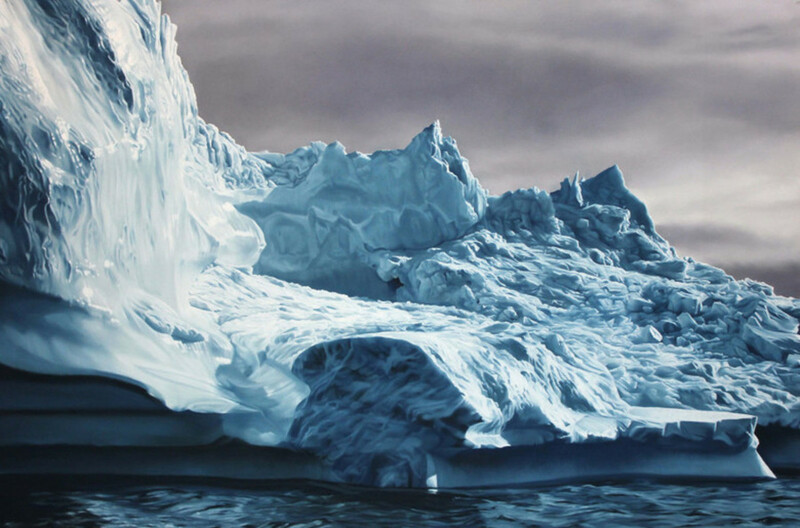 How did Zaria Forman, the Iceberg Painter, Go Viral? Time and time again, the internet has proven to be one of the most powerful networking and exposure tools ever created. You know what I'm talking about, seeing the latest viral video on YouTube, or seeing the latest Facebook post with one million likes or shares. It's become so commonplace that most wouldn't think twice about it. Yet for a select few, going viral on the web can have life changing benefits. Meet Zaria Forman, an artist from New York City, New York. Looking at her paintings you are filled with a sense of awe and wonder. Their breathtaking quality and craftsmanship, would quite literally speak for themselves. Over New Years 2014, an innocent posting of her paintings that I would make on a social network would inadvertently trigger a viral spree that would catapult Ms. Forman into worldwide internet fame. Ultimately benefiting her both financially and critically. 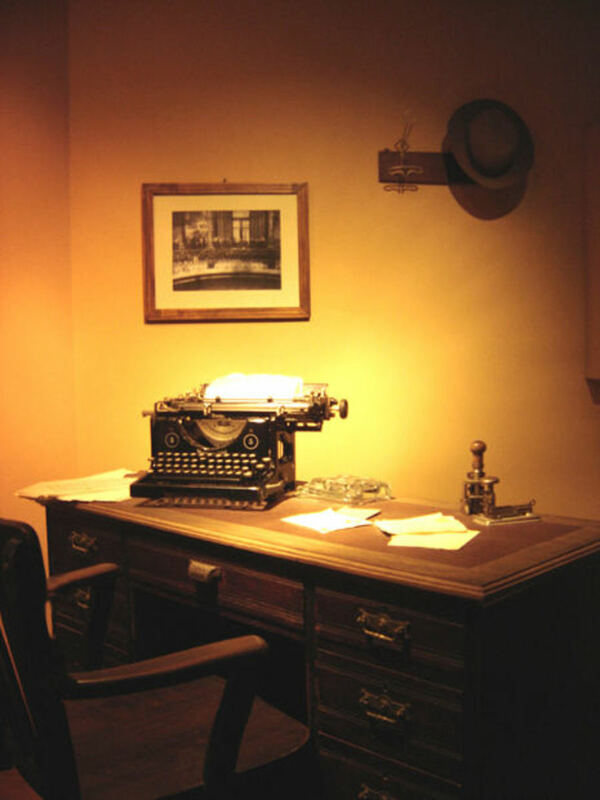 Here is the remarkable story of how one post makes a name household. 100,000+ 'Reblogs' or Tumblr's version of Facebook 'Shares.' Tumblr is a blog style site predominantly used by teenage hipsters eager to escape the mainstream nature of Facebook. 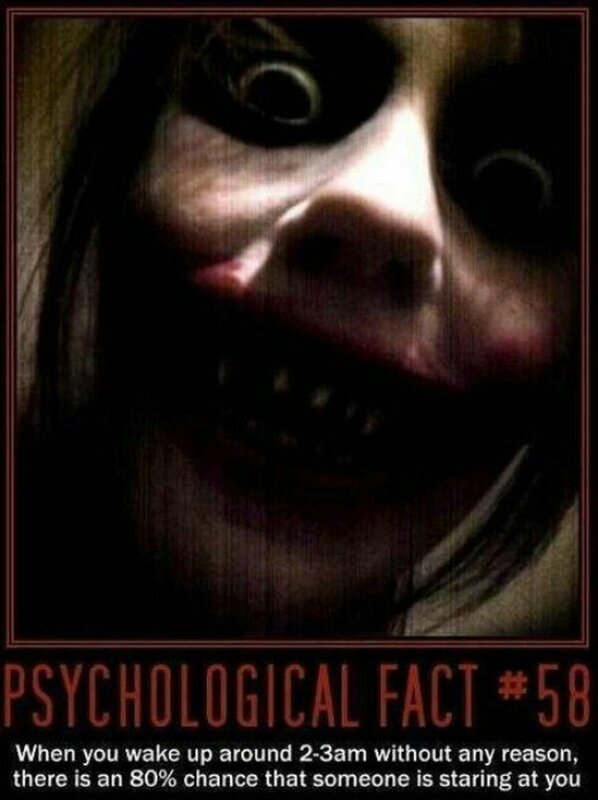 I often find myself browsing the internet aimlessly when I cannot sleep. So was the case on December 29, 2013. After a family filled day of food, celebration and spending time with my girlfriend, I retired to my bed thinking I would fall asleep rather quickly....nope. My brain, wired from all the sugar cookies and candy cans refused to relent. Rather than toss and turn until the wee hours of the morning, I opened my laptop and began to browse. Hoping I would win this battle with my brain by boring it to death, I scrolled aimlessly through the hundreds of unchecked posts on my Tumblr dashboard. I scrolled and scrolled until something caught my eye. 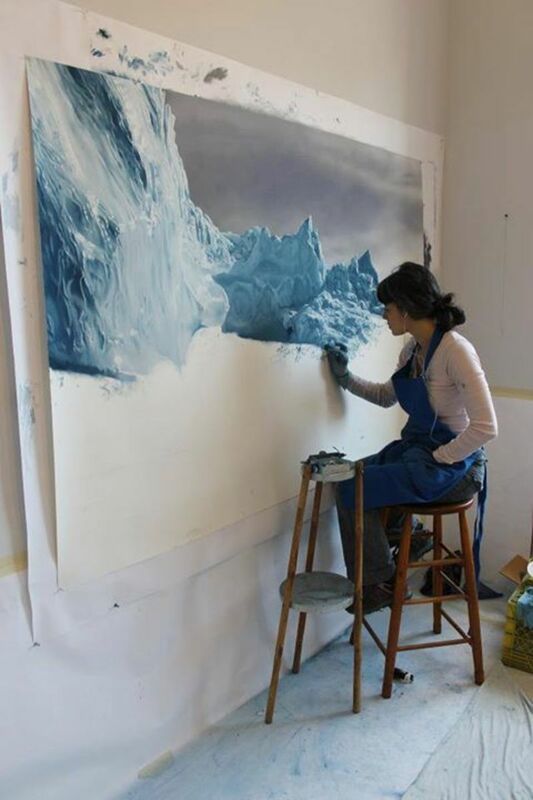 A post of a young woman painting an iceberg. 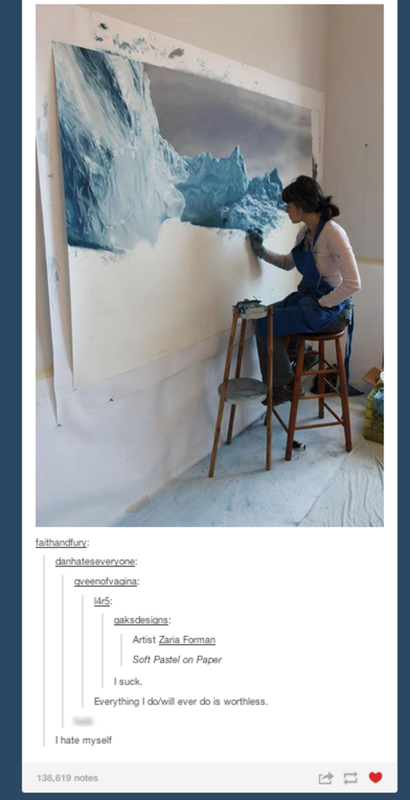 At first I was like, "Why is she painting snow?" After I enlarged the post then I saw the edges of the canvas and the true genius of the artist. "Wow, that's a picture!" More details caught my eye. "Pastels? Now that's cool! I wonder what Imgur would think about this." Imgur - Planting the seed. Where Tumblr can be considered a relaxing drive in the country side, Imgur is the speeding car on the freeway. On Tumblr you're viewing blog posts at your leisure, your pace and time, never missing anything. Imgur is aggressive, fast paced, where you only have a few moments to view, comment, or share a post before it becomes hopelessly buried in a sea of other posts never to be seen again. The only thing that keeps a post afloat is the number of times it is liked or commented. 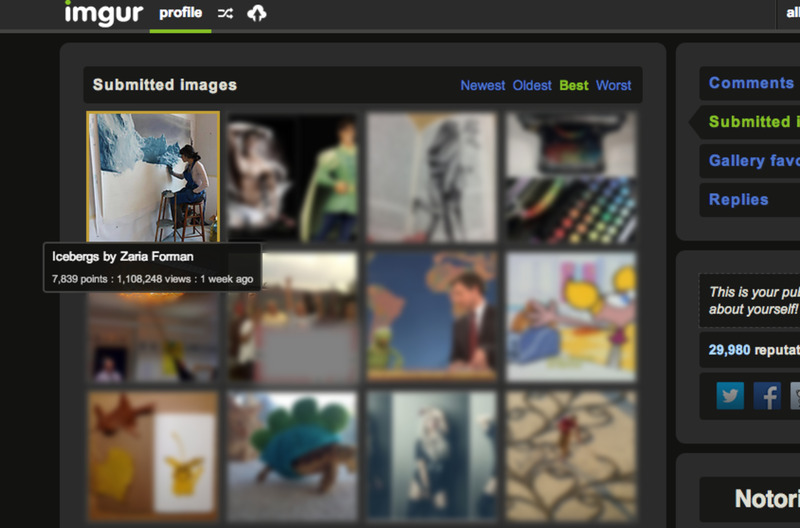 If it reaches a threshold, it is moved to Imgur's 'viral' page where it can enjoy a few more moments of fame. Posting on Imgur takes only a matter of seconds. As I was starting to finally feel tired from the day, I resolved to post Zaria's Icebergs and then drift into Slumberland. In less than one minute, the images were uploaded, the title "Icebergs by Zaria Forman" was set and the image was on it's way to Imgur's public gallery for what I though would be a couple dozen viewpoints and comments. Unable to keep my eyes open, I shut my laptop and went to sleep. The following day, I opened my laptop to my still open Imgur page. I hit refresh and gasped. In less than eight hours, the post which I though would earn just a few views had earned more than 100,000! Comments were pouring in and so were the ratings. "Dang!" I thought to myself. "Icebergs are more popular than I thought!" It wouldn't be until later on that day did I start to realize the significance of the post I casually placed on Imgur. Following my daily internet regiment of websites, I pulled open Reddit: The Front Page of the Internet and froze. On the front page in the #3 slot was 'Icebergs by Zaria Forman' the hyperlink to my Imgur post of Ms. Forman's amazing work. I could not believe it. For those of you unfamiliar with Reddit, let me explain. Reddit is a social news and entertainment website that is 100% user generated. A story or image is posted on Reddit and through a series of upvotes and downvotes is ranked up or down on the page's order. The higher the votes, the higher the rank. Here's the catch: 99% of all posts on Reddit go undiscovered often without a single vote. 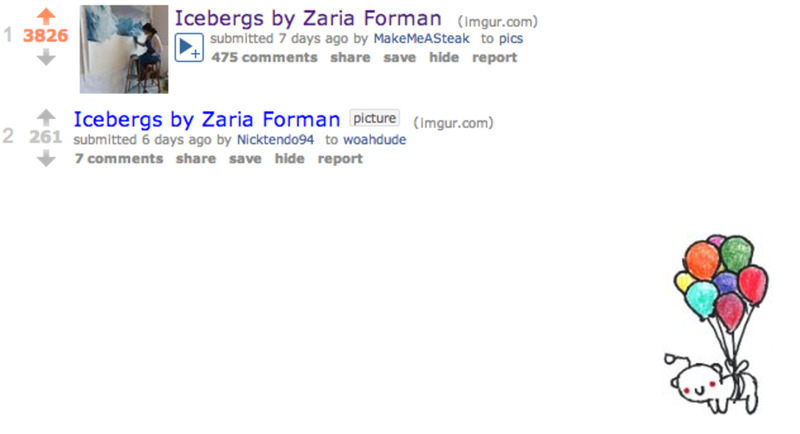 So reaching the front page is kind of a big deal since Reddit's Front Page receives tens of millions of hits per day. A post will only last a matter of hours on the Front Page before it is permanently down voted into obscurity. This is known as The Reddit Effect. Clicking the embedded link on the Reddit post took me back to my original Imgur post which now had reached over 750,000 views! "Wow.....I am so surprised." I thought to myself. It wouldn't hit me until a week later just how significant of a post that would be. 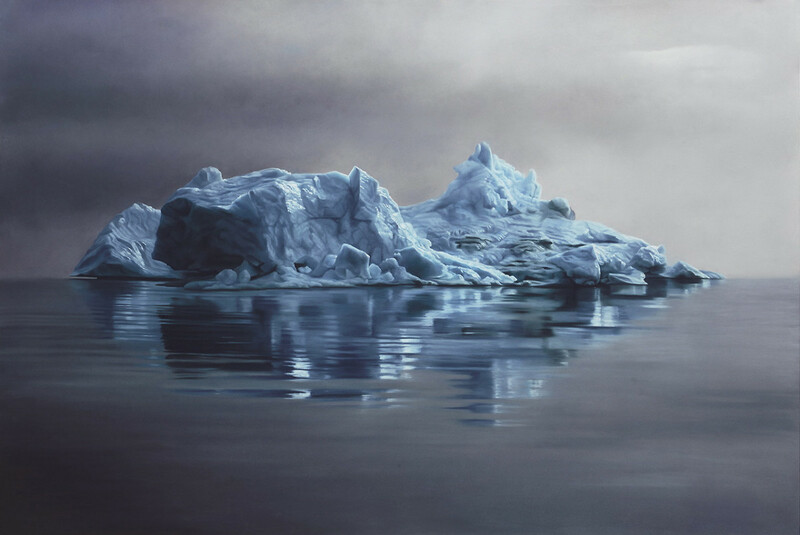 'Icebergs by Zaria Forman' as seen on Reddit. A week or so later I returned to my Imgur page and was not prepared for what was waiting for me. In addition to my post reaching over one million views, there was a private message in my Imgur inbox from Zaria Forman herself! "Hello! I wanted to thank you for posting my iceberg drawings!" Wrote Zaria, "...THANK YOU so much for that...these last 2 weeks have been completely insane and the sale/press inquiries keep rolling in... I know your post had a lot (if not everything) to do with that! MUCH APPRECIATED!!!!" I sat in total silence. I had just contributed to an artist's discovery! I quickly responded to her message. She responded moments later with the details of her last couple of weeks. Turns out the viral effect of the original Imgur post has catapulted Zaria into a level of success she'd never seen before. Her phone was ringing off the hook, sales of her work, press releases and interviews had exploded beyond her wildest dreams. In addition to her Icebergs, other works of hers had also spilled out to every corner of the cyber world from the United States to India. 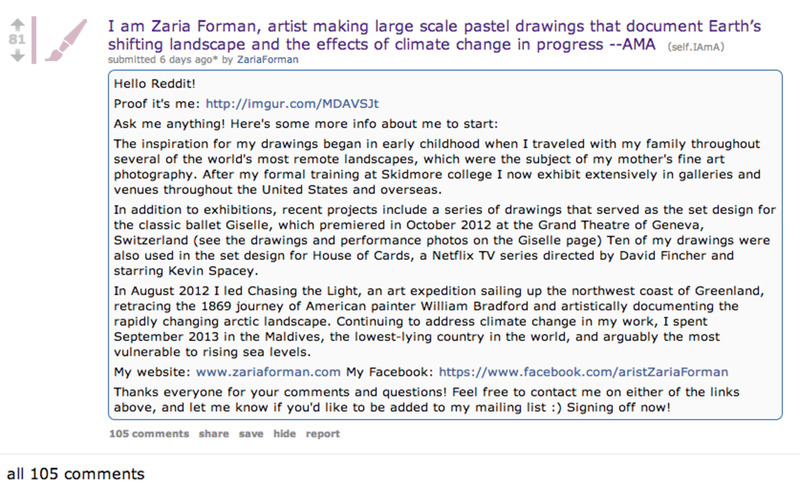 Newpapers, blogs, TV shows, journals, all wanted to feature Zaria's work. The Imgur post had been posted twice to Reddit. It triggered a Reddit press conference known as an "Ask Me Anything" where Zaria answered questions and comments directly with the readers of the site. From there, it simply multiplied exponentially. My original Imgur post has since faded into inactivity yet Zaria's success continues. In addition to gaining Zaria as a friend, I've gained powerful lessons in the world of social networking. You simply never know when or where a post will go viral. Predicting it is all but impossible. When posting other people's work, always cite and source the original material and/or artist because it is they, not you, that should reap the rewards. This could have had a far different outcome if I hadn't have sourced the original artist. When posting your own work, never underestimate the power of social networking. Keep trying and trying and, who knows, it could just happen to you. Zaria's work literally spoke for itself and engaged enough people to benefit her. The extraordinary events chronicled in this Hub certainly define that in the Information Age, getting discovered can happen to anybody at any time. In the days before the internet, people had to rely on established means of distribution in order to find prestige-publishers, television networks, etc. 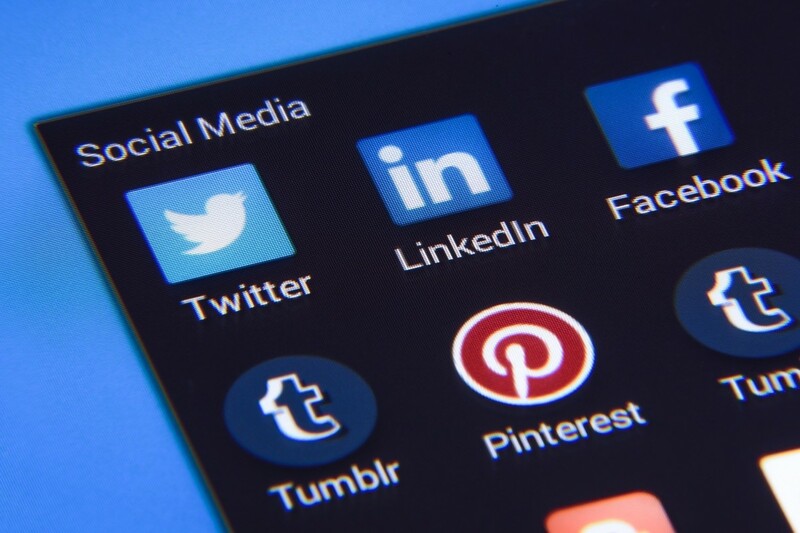 Some might argue that the internet makes it too easy for people to 'self promote' or get discovered, arguing that people don't have to like your work anymore in order to get exposure. That's really not the case. The post on Imgur easily could have failed to garnish any attention. People had to like what they saw in order to promote it further. It's as simple as that. Thanks for reading my Hubpage! This was such an exciting experience for me that I simply had to share it. This is why I love the Information Age and the power it holds. 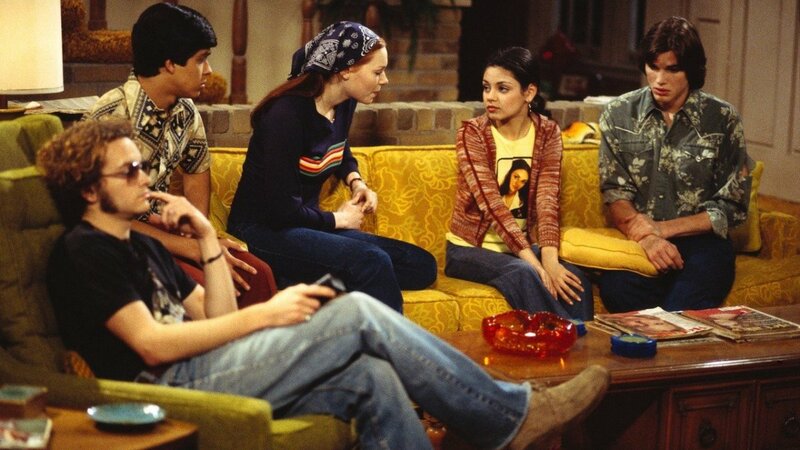 Who Was the Best Character on That '70s Show? This is very cool! Love the way it all worked out and the fact that you are generous spirited about her her success from you promotion. That's great stuff! What an amazing story. 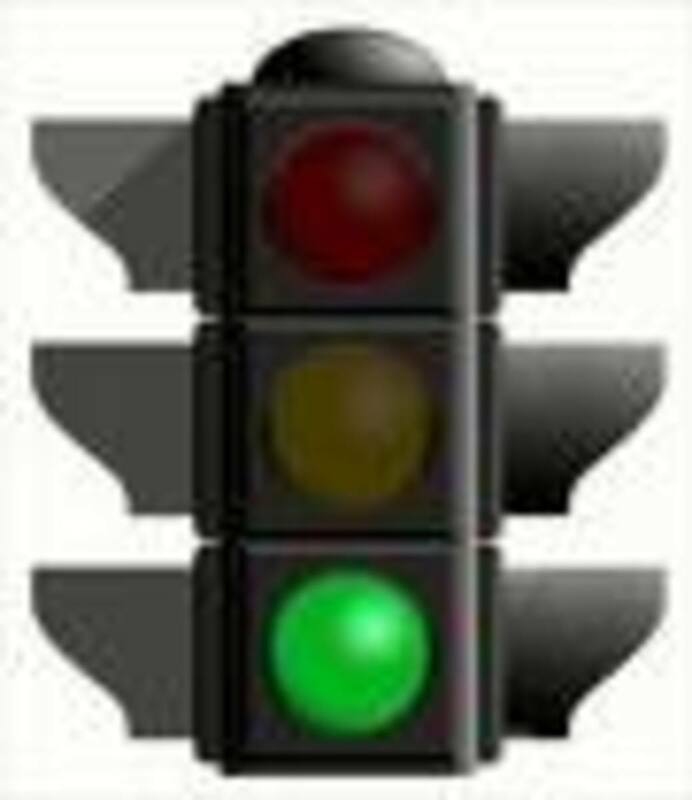 I've been trying to earn money online for years and find the going very slow. It seems I've still got a lot to learn about internet marketing.